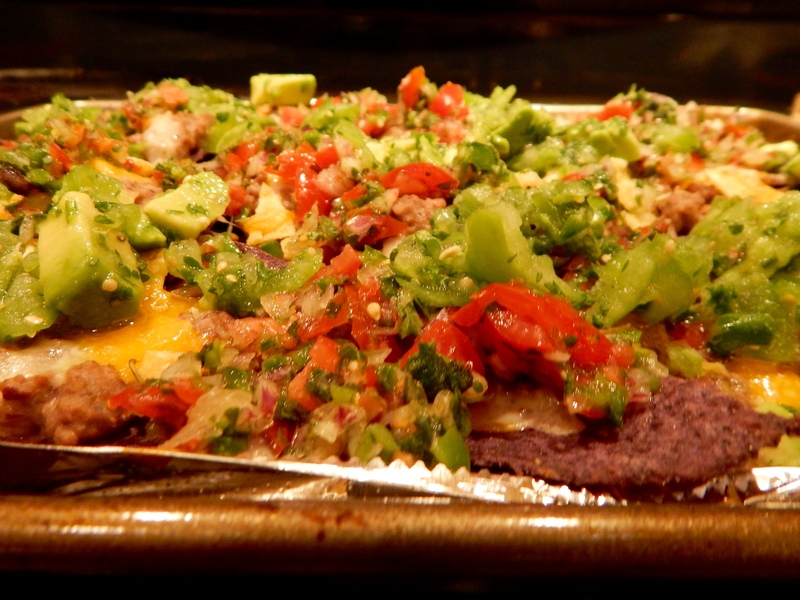 This is the original Black Bean Nacho recipe I modified by using 8 0z. cooked and crumbled goat chorizo to the black beans and substituting blue corn tortilla chips for yellow or white corn chips. The original recipe is delicious on its own, but the goat chorizo takes it to new heights! The blue corn tortilla chips are a great color to set off the salsas. Enjoy! Combine tomatoes, onion, jalapeño, and vinegar in a medium bowl. Season with salt and pepper and let sit at least 1 hour. Stir in cilantro and oregano just before serving. Heat oil in a large skillet over medium-high heat. Add onion, garlic, and jalapeño and cook, stirring often, until softened, about 3 minutes. Transfer onion mixture to a food processor and add black beans, lime juice, and ¼ cup water. Season with salt and pepper and process until smooth. Combine tomatillos, avocado, cilantro, jalapeño, and lime juice in a food processor and purée until mostly smooth. Season with salt and pepper. Preheat oven to 425°. Arrange half of chips on a 9½-by-13” foil-lined rimmed baking sheet. Top with half of beans, then half of each cheese. Repeat layering with remaining chips, beans, and cheese. Bake until cheese is melted and bubbling, about 5 minutes. Serve nachos topped with tomatillo avocado salsa, pico de gallo, sliced jalapeño, and radishes. Lamb and Goat Chorizo? ¡Por que no! Manuel Ornelas and Maria Marquez from Tierra del Sol Farms in Ft. Hancock are at the Farmer’s Market every weekend with wonderful lamb and goat raised and processed at the farm. A couple of weeks ago, I tried their lamb chorizo and loved it. Last Saturday, I got a packet of their goat chorizo and am now hard pressed to choose one over the other as a favorite. The meat is ground and has a texture similar to ground beef. It is like the bulk chorizo I prefer when I buy it. There is no comparing it with the red mystery stuff in a plastic tube we think of when we hear the word “chorizo”. Mexican chorizo is traditionally a pork sausage highly seasoned with garlic, chile and other spices. Spanish chorizo is sometimes made with smoked pork. There are also hard chorizo sausages. Casings should be removed and the sausage crumbled as it cooks. First I tested each variety of chorizos with scrambled eggs in a basic breakfast burrito. Both are very lean. You can get either in link form or bulk form. They are well seasoned and have enough kick to make this Texican happy. There is a difference in the flavors of lamb and goat. Lamb and egg burrito on a whole wheat tortilla and a side of beans and verdolagas (purslane) growing in the front yard after the monsoon rains. Next, I experiment. I made a thick white sauce and added the lamb chorizo. The sauce held the crumbled browned chorizo on a sandwich topped with a fried egg and cheese. Not too creative, but very good! It was egg and goat burritos for the first test of the goat chorizo. It looked a lot like he lamb burrito above, but it did taste different. Goat Chorizo and Black Bean Nachos with Two Salsas. WOW! My adaptations to the original was adding cooked and crumbled goat chorizo to the black bean mix and using blue corn tortilla chips instead of yellow for the nacho base. I also used more jalapeños than the recipe called for. I made two layers of tostadas, bean mixture and the cheeses on a foil lined sheet pan and baked it in a preheated 425º oven for about 7 minutes to warm up the beans and melt the cheeses. Out of the oven and topped with the two salsas – tomatillo/avocado and a pico de gallo given a new dimension with chopped fresh oregano. I’ll be making these nachos again. I can see making it a little wetter as casserole as a side dish, perhaps. I do expect I’ll be putting some packets of goat chorizo in the freezer for when the urge hits. It’s difficult for me to pass up surf and turn on a menu. A wonderful steak and lobster tail with drawn butter, or even steak and shrimp are a celebratory combination. I’ve even posted steak and 4 oz lobster tails here. I call the little tails 3-bite lobster. Just enough to satisfy a craving for lobster without breaking the bank. While looking over the seafood at my favorite meat counter, I kept coming back to a favorite treat – the green chile krab salad. It is krab with a k because it is a whitefish surimi with crab flavor and a splash of red for color. They add a bit of mayo, black olives, celery and little onion and lots of green chile and it is a great treat. I like to serve it in an avocado half (or two) as a light lunch or dinner in hot weather. Next to the crab was a icy bin of cooked and peeled large shrimp. A couple of windows back were some lush thick cut steaks. And suddenly, I imagined something that should be good for dinner or for lunch. I collected what I thought I’d need, went home and got busy. Surf and Turf al Gringo Gourmet: green chile krab salad from the deli, a lean hamburger patty, a schmear of avocado and shrimp on a toasted brioche. On the side, grape tomatoes, a jalapeño and a handful of Fritos. I think this looks more complicated that it really is. The only cooking (for me) was toasting a split brioche and frying up a couple of lean hamburger patties. The rest was assembly: top the bottom piece of toast with lettuce leaves, spread liberally with the green chile krab salad, top with a hamburger patty, a schmear of avocado and garnish with cooked shrimp. Finish the plate with grape tomatoes and a jalapeño for color and kick and a handful of Fritos because I love Fritos and a sandwich lunch is all the reason I need to have some! It is a dramatic eat it with a fork sandwich that could become a regular here. Green Chile Cheeseburger and a Potato Salad You’ll Want to Make Again and Again! Who doesn’t love a green chile cheeseburger? Everyone has a favorite way of making them. I like to use telera rolls spread with spicy mustard and mayonnaise, leaf lettuce and tomato slices, a lean beef patty cooked medium rare, and sharp cheddar cheese. Of course it is all topped with a generous two or more tablespoons of chopped green chile. When I served the burgers, I realized I’d forgotten to slice the Texas 1015 sweet onion (They are optimally planted on Oct. 15, not just because that is my birthday). I’d bought the onion just for the sandwiches. I guess I’ll have to make them again pretty soon and remember it next time! I like the telera rolls for a change. They are what make Mexican tortas (sandwiches) so special. My favorite potato salad this summer is smashed baby potatoes with a mustardy vinaigrette and thinly sliced jalapeño or serrano chiles. I usually cook three baby potatoes per serving to reduce carb consumption and satisfy that occasional potato craving. I roast them sometimes or boil or even microwave them at other times. Roasted is best, but August is not the time of year to fire up the oven for six baby potatoes. I’m including the original recipe in this post, it can be reduced or expanded easily. I do make a full recipe of the dressing so I’ll have some left over for salmon, or a ham sandwich with Swiss cheese! Green chile cheeseburger and Smashed Baby Potatoes with Jalapeños are a great summer salad idea. 2 lbs baby or fingerling potatoes, halved crosswise if large. 1 jalapeno, sliced into thin rounds, seeds removed if desired. While the potatoes cook, whisk vinegar and mustard in a large bowl. Gradually whisk in remaining 1/4 oil until emulsified; season with salt and pepper. Add potatoes, jalapeño and parsley and toss. Season to taste with salt and pepper. I like to mix red and white baby potatoes. You could add purple potatoes for the 4th of July, but they cook faster than the red and while ones. I use a hand held mandoline on its thinnest setting to make lots of little slices. Feel free to add more jalapeño or serrano chile slices up the heat if you wish. I’ve made this salad both with and without the parsley It is delicious either way. Brussels Sprouts Can Be Exciting! I saw that ahi tuna portions were on sale yesterday. I went to the store to pick up a couple. Of course they were out at the store close by. My trusty meat counter guy called another branch and reserved a couple for me. The meat counter guys take very good care of me. As I drove the couple of miles to the other store, I pondered what to serve as a side. I recalled a recipe for Hashed Brussels Sprouts and decided that would work. Both the tuna and the sprouts turned out well as you can see below. My secret ingredient for the tuna crust is a bag of wasabi mix – wasabi peas, crackers, nuts and seed. This zippy snack tempers down when cooked. A couple of whirs and grinds in the food chopper made a nice meal of the snack mix for my crust. I dip the tuna steak in flour, then in egg and finally in the wasabi meal and pat it to get an even coat. The a sear in a hot pan makes the crust crunchy, a quick flip and the bottom side is seared and the tuna transferred to a platter so it won’t get overdone. No way will I let a beautiful tuna steak go gray and look like it came from a can! The hashed Brussels sprouts are trimmed, halved and shredded on my small, handheld mandoline. I could have slivered them with a knife, but I love my mandolines. The sprouts are cooked briefly in a little oil and then tenderized in a dressing of lemon juice, garlic, poppy seed and white wine. The hash makes a nice side that holds its own with the crusted tuna. I think next time, I’ll sprinkle a little of the wasabi meal on the sprouts for a little extra zip. Wasabi meal crusted tuna steak in rare glory! A side of hashed Brussels sprouts with lemon and poppy seed dressing compliments the seared tuna. Combine Brussels sprouts and lemon juice in a large bowl and toss. The lemon juice starts the tenderizing process of the sprouts. Warm the olive oil in a large skillet over medium heat. When the oil is hot, stir in the Brussels sprouts, poppy seed and garlic and cook a couple of minutes. Add the white wine and stir until the sprouts are bright green and just tender (3 – 5 minutes). Remove from heat and season with salt and pepper. Plate individual servings or transfer to a platter and serve as a side dish.